Select the source of the article or articles you would like to import from the menu to the left. To add a source to the group, select the "All" group, then drag a source onto the group in the list to the left. is not currently a collaborator on this review. 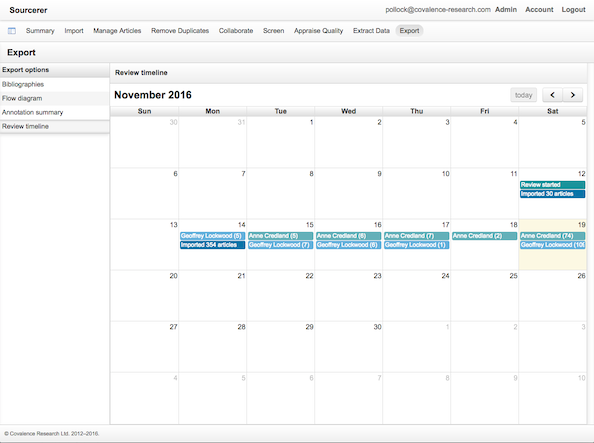 The Collaborate pane allows you to invite colleagues to share the screening of a review or to screen all articles. The Appraise Quality pane allows you to appraise the studies in your review using a variety of appraisal instruments. 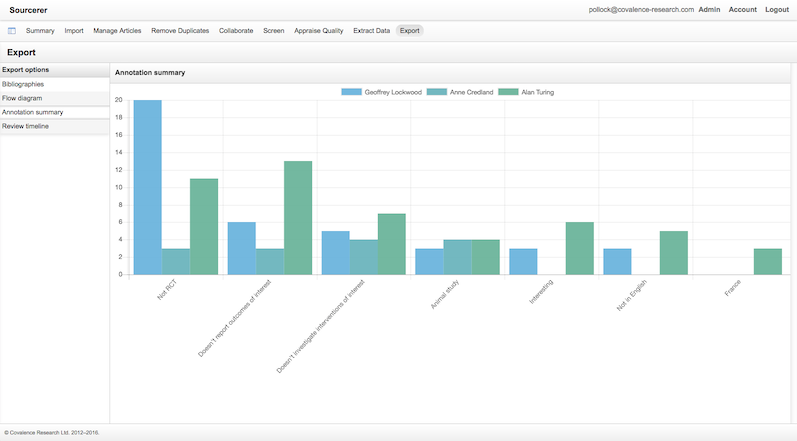 The Extract Data pane allows you to systematically extract data from the studies in your review. Click the "Specify data for extraction" button to define which data should be extracted. Select an export option from the menu to the left. Articles from any stage in a flow diagram (under the Export pane) can now be viewed in situ in the multiple article browser by using the "View" buttons on every flow diagram row. The multiple article browser is now available from more places: search results, source article lists in the Manage Articles pane, and the table view in the Screen pane. If you have a review already set up with preferred highlights for a particular study type or therapy area, you can now import these into a new review by clicking the Import menu in the Highlights side bar and selecting the name of the review from which highlights should be imported. Sourcerer is now running on a new infrastructure based on the latest long-term support Linux release, Java 11, MySQL 8.0 and Spring 5, with double the memory, double the processor cores, more storage, and more network bandwidth. 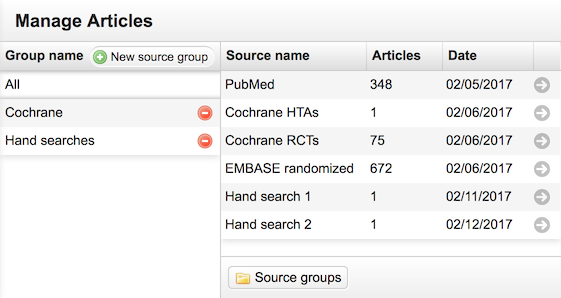 Articles can now be marked as duplicates directly from the title and abstract screening view. Articles accidentally marked as duplicates can be included in the review again by using the "Mark article as unique" functionality available from the "Current duplicates" list in the Remove Duplicates pane. Articles can now be searched from the Manage or Screen panes using the AND Boolean operator (which must be written in capital letters). Clicking on a search result will highlight each component of the search term in the abstract. 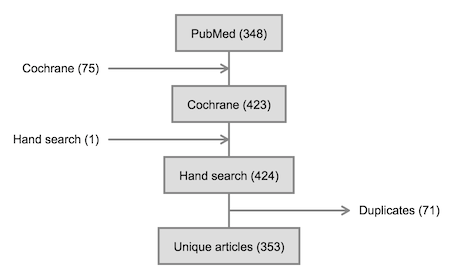 Various issues with the PubMed parser have been fixed, making it much more robust in its handling of HTML content in article abstracts. Highlights can now be applied in the table and resolution views in the Screen pane. Just click the "Show highlights" checkbox. Sources can now be grouped together in the Manage Articles pane. Click "Source groups" at the bottom of the source list to open the Source groups panel. Click "New source group" to create a new group, enter the group name, click "OK", then drag and drop sources from "All" to add them to the group. Source groups appear in flow diagram menus, allowing arbitrary groups of imports to be presented in the literature flow. A minor but important addition: entry and exit points from flow diagrams now include an arrow head showing the direction of flow. A bug in the annotation summary chart has also been fixed to prevent it from occasionally showing data from a previously-viewed review. A review timeline is now available in the Export pane. The review timeline is presented as a month-view calendar showing when the review was started, when articles were imported and the number of annotations added to the review by all collaborators per day. A bar chart showing an overview of all collaborators' annotations is now available in the Export pane. 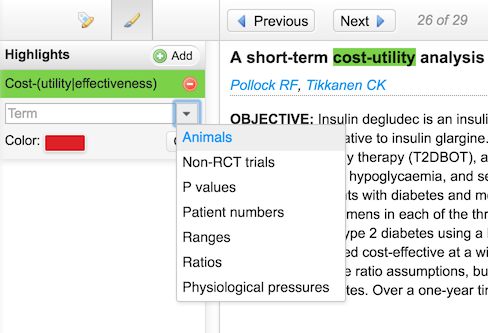 When adding a new highlight in the Screen pane, Sourcerer now provides a list of defaults, including animals, p values and patient numbers. These default highlights remain "live" meaning that you automatically benefit from the matching logic as it improves. The animals highlight recently gained knowledge of woodchucks and ducks, for example. © Covalence Research Ltd. 2012–2019.